On Friday 12th April the whole school community gathered in the school hall for an end of term assembly. Our annual fundraising Bake Sale and Jumble Sale for Trócaire took place on Friday 12th April 2019. New traffic and safety arrangements are being implemented from Mon 1st April 2019. 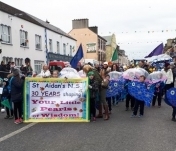 On St Patrick's Day, as is customary, Banna Ceoil Scoil Aodáin led the parade in Kiltimagh. We recently had a visit from Sorcha from Mayo County Council who came to present the Leave No Trace programme to our senior pupils. We have all been very busy here in St. Aidan's preparing for Christmas. All classes from St. Aidan's took part in our recent fundraising Christmas concert . 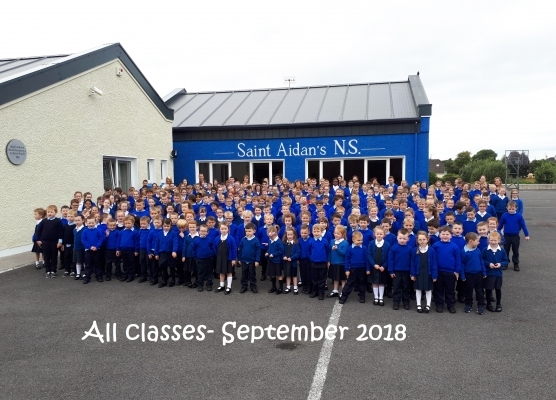 A Mass of Thanksgiving was celebrated on 19 Oct 2018 to mark the 30th anniversary of the opening of St Aidan's N.S. Kiltimagh. Happy Halloween from all at St Aidans! Our annual sponsored walk in aid of St. Aidan's N.S. took place on Sunday 14th October 2018. Well -done to all the pupils in 3rd 4th 5th and 6th class who participated in the recent cross country competitions. Welcome back to all our pupils and staff as we start our new school year. We had our final assembly for the school year on Monday 25th June 2018. Congratulations to all the Sixth Class pupils who graduated from St. Aidan's N.S. this June. On Wed 23 May our school choir took part in a concert, organised by Mayo International Choral Festival, to honour George Lee. Congratulations to all the children from Second Class who made their First Holy Communion in The Church of the Holy Family, Kiltimagh on Saturday 12th May 2018. Our fundraising Bake Sale and Jumble Sale for Trócaire was a great success! 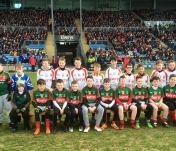 Well done to the boys from 5th and 6th class who participated in an exhibition match at half-time on Sunday 18th March at the Mayo v Tyrone game. This year, as is customary, Banna Cheoil Naomh Aodáin and the majorettes took part in the St Patrick's Day Parade in Kiltimagh. Book Week took place in St. Aidan’s N.S. from Mon 27th Nov - Friday 1st Dec. This is an annual event and helps to further promote an interest in and love of reading. This year, once again St. Aidan's are taking part in the Team Hope Shoebox Appeal. Science Week 2017- Design a Raft Challenge. Science Week 2017 takes place all over Ireland from 12-19 November. On Friday 27th Oct 2017 St Aidan's were delighted to welcome back two past pupils Dayna Finn and Maggie Byrne, European Basketball finalists, to raise our 4th Green Flag. Well done to all who competed in the Cross Country Running county finals in Beleek, Ballina. Our annual sponsored walk in aid of St. Aidan's N.S. took place on Sunday 1st October 2017. East Mayo Cross Country Trials. On Friday 15th September St Aidan's pupils and staff came together in our school hall to show their support for the Mayo team in the All-Ireland Final on Sunday. We had our final assembly for the school year on Tuesday 27th June 2017. The assembly began with a short prayer service. On Friday 16th June 2017 the whole school community assembled to celebrate the retirement and Golden Jubilee of Fr Paddy Kilcoyne, Chairman of The Board of Management and the retirement of Kathleen Walsh SNA. Congratulations to 6th Class and their teacher Mr. Donnellan who were recently awarded The Blue Star certificate and EU flag. Congratulations to all the pupils from 5th and 6th Classes who were confirmed on Sunday 14th May 2017 in The Church of the Holy Family, Kiltimagh. St. Aidan's N.S.were awarded their fourth Green Flag by An Taisce at an award ceremony in The McWilliam Park Hotel, Claremorris on Thursday 11th May. Congratulations to all the children from Second Class who made their First Holy Communion in The Church of the Holy Family, Kiltimagh on Saturday 6th May 2017. We have been very busy here in St. Aidan's over the past few weeks preparing for Saint Patrick's Day. An Internet Safety Talk will be hosted by St Aidan's Parents Association on Monday 6th March at 8:30pm. This week is Catholic Schools Week. Please support our Christmas Raffle. Draw will take place in the school hall on Wednesday 21st December. Our annual sponsored walk in aid of St. Aidan's N.S. took place on Sunday 9th October 2016. Gary Smyth, Heneghan’s Pharmacy and Genfitt under manager Ronan Egan have very generously sponsored a set of 20 laptops to the pupils of St. Aidan’s N.S. Welcome back to all our pupils and staff. We had our final assembly for the school year on Friday 24th June 2016. Travel Week 2015/2016 took place last week from May 16th- 20th. All of our hard work has paid off! St. Aidan's has achieved a Science Foundation Ireland Discover Science and Maths Plaque of STEM Excellence for the 2015/16 academic year. As part of the Green School's initiative the school is now focusing on Travel as their next theme. Congratulations to 2nd Class who made their First Holy Communion last Saturday. Active School's Week will take place from April 25th - 28th next. Today, we celebrated the 100th anniversary of the Easter Rising, the rebellion for Irish independence. For the past few weeks all pupils were busy learning about different aspects of the Rising so we had an assembly to show the community all of our efforts and raised our National Flag outside after. 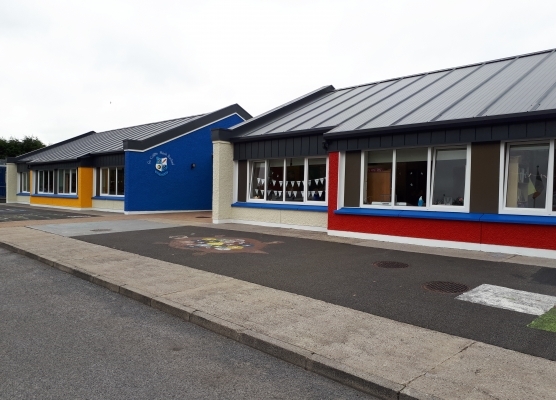 Bhí Seachtain na Gaeilge gnóthach againn i Scoil Aodáin agus bhí sé iontach an méid Gaeilge a bhí le cloisteáil ar fud na scoile. This week was Engineers' Week around the country. On Wednesday, Thomas Campbell, a civil engineer who works in the area of water treatment plants came to visit the school. On Tuesday 1st March five members of the Franciscan Order of Missioners visited our school. Congratulations to St. Aidan's N.S. choir who have been awarded 1st place in the choral competition for Primary School as part of the Kiltimagh Choral Festival. 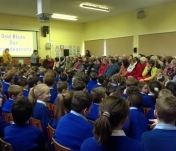 The highlight of the week was Grandparents' Day on Wednesday 3rd February. As we start a new term, in conjunction with our Healthy eating policy, we once again focus on encouraging pupils to make healthy choices regarding their food. All classes from St. Aidan's took part in our recent fundraising Christmas concert . Each class performed at a matinee and evening show. Book Week took place in St. Aidan’s N.S. from Mon.23rd to Fri. 27th November. This is an annual event and helps to further promote an interest in and love of reading . Happy Halloween from all at St. Aidans! St. Aidans NS, along with schools all over the country, took part in Maths Week Ireland from October 12-16th. Our annual sponsored walk in aid of St. Aidan's N.S. took place on Sunday 4th October 2015. Four teams from third, fourth , fifth and sixth classes participated in the East Mayo Cumann na mBunscol Cross Country Running competition in Swinford on 23rd September 2015. As we begin our new school year we focus on healthy lifestyles for the first term. A special assembly was held in St. Aidan's N.S. on Wednesday 24th June to mark the retirement of our principal Mrs. King. 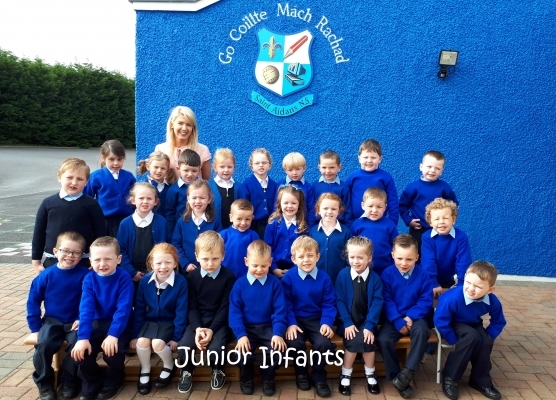 On Friday 5th June the 6th Class pupils were awarded their Blue Flag.  Congratulations to all the children from Second Class who made their First Holy Communion in The Church of the Holy Family, Kiltimagh on Saturday 9th May 2015. This week is Get Active Week in our school. On Wednesday 25th February school staff and pupils came together for our Easter Assembly. Congratulations to the two teams who competed at Chapter level in the Credit Union Schools Quiz in Knockranny House Hotel, Westport on Saturday 28 February 2015. Congratulations to both teams from Saint Aidan's N.S.who came first in the recent Credit Union Quiz. Congratulations to the girls from St. Aidan's N.S. who represented the school at the Cumann na mBunscol Handball competition in McHale Park on 8th February 2015. Pupils from 2nd,3rd and 4th Class attended the Irish Times - Music in the Classroom Concert in The Royal Theatre, Castlebar on Monday 12th January. Congratulations to all the winners of the recent Credit Union Poster Competition. Book Week took place in St. Aidan’s N.S. from Mon. 2nd to Fri. 6th Dec.
St. Aidan’s NS Shoebox Appeal 2014 . Once again the pupils of St. Aidan’s N.S. responded with great generosity to the Team Hope Shoebox Appeal. St. Aidans NS took part in Maths Week Ireland from October 1-19th. Well done to the girls from St. Aidan’s N.S. who got through to the final and beat Meelick N.S. in the Cumann na mBunscol Mini Sevens competition held in the Amenity Park in Swinford on Wed. 15th Oct.
Our annual sponsored walk in aid of St. Aidan's N.S. took place on Sunday 5th October 2014. Four team from third, fourth , fifth and sixth classes participated in the East Mayo Cumann na mBunscol Cross Country Running competition in Swinford on 25th September 2014. Welcome back to all our pupils. We had our final assembly for the school year on Wednesday 25th June 2014. We had a very active and enjoyable Sports Day on Tuesday 24th June 2014. 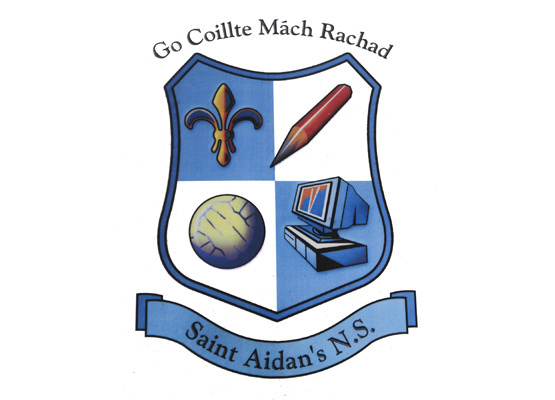 Visit of GAA President to St. Aidan’s N.S. TThe GAA President, (Uachtarán Cumann Luthchleas Gael )Liam O'Neill visited all the classes in St. Aidan's N.S. on Tuesday 20th May. 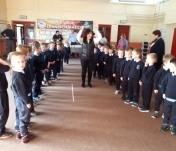 Congratulations to all the children from Second Class who made their First Holy Communion in The Church of the Holy Family, Kiltimagh on Saturday 10th May 2012. Our recent fundraising Golf Classic was a great success. Congratulations to all the winners of our school raffle which took place in the school hall on Friday 4th April. A choir from St Aidan's N.S. took part in the Kiltimagh Choral Competition on Friday 28th February 2014. The theme of Catholic Schools Week for 2014 is Catholic Schools -Places of Faith and Learning. Book Week took place in St. Aidan’s from Mon. 2nd to Fri. 6th Dec. The pupils of St. Aidan’s N.S. responded with great generosity to the Team Hope Shoebox Appeal. The recent Sponsored Walk was a huge success. Recently Conor Byrne, All-Ireland Minor winner and past pupil, brought along the Tom Markham cup to the school. On September 30th, to celebrate Mayo Minors and Seniors reaching the All-Ireland Final St Aidan's held a Red & Green Day.